Balancing professional responsibilities with commitments at home is challenging for many working parents, the majority of whom admit to feeling stressed about juggling work and family life. A 2013 survey from the Pew Research Center found that 56 percent of working mothers and 50 percent of working fathers find it difficult to balance their personal and professional responsibilities. While the same survey found that only 23 percent of mothers feel they spend too little time with their children, those figures doubled for fathers. Finding more time for family can seem impossible, especially as children get older and get more involved in school and extracurricular activities. Kids growing up and getting more active in school and in their social lives tends to coincide with parents advancing in their careers and taking on more responsibilities at work. But no matter how hectic family schedules become, parents and kids can work together to find more time for one another. 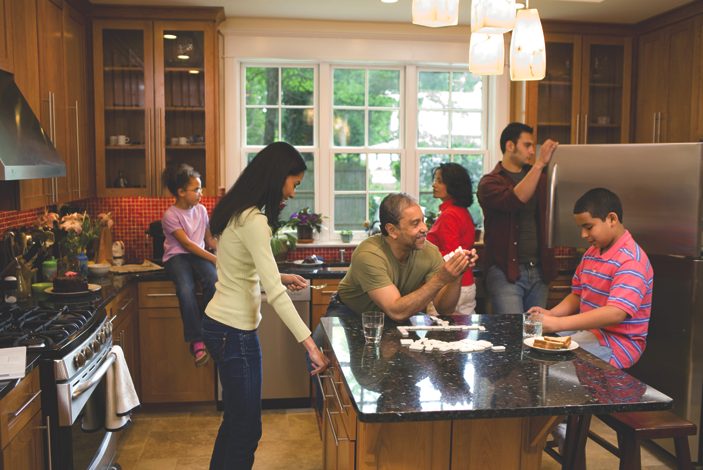 · Commit to nightly family dinners. Family dinners do more than just ensure kids are eating healthy meals each night. In its “The Importance of Family Dinners VIII” report, the National Center on Addiction and Substance Abuse at Columbia University found that, compared to teens who have fewer than three family dinners per week, teens who ate dinner with their families five or more times per week were one a half times more likely to say their parents knew a great deal or a fair amount about what’s really going on in their lives. The report also found teens who say their parents know very little or nothing at all about their lives were one and a half times more likely to have used marijuana and one and a half times more likely to have used alcohol than teens who said their parents know a great deal or a fair amount about their lives. Nightly family dinners need not include elaborate meals, but parents who find time to have dinner with their children at least five nights per week may end up knowing their kids better and helping their sons and daughters avoid risky behaviors. · Inquire with your employer about telecommuting. Telecommuting can be very family-friendly, allowing parents to cut out potentially lengthy commutes and spend more time with their children as a result. George Washington University in Washington, D.C. cites encouraging a better work-life balance for its employees in support of its telecommuting policy. The university notes that employees who have a better balance between their personal and professional lives may benefit from reduced stress and stronger overall health, which benefits the university by reducing healthcare costs. Parents who want to find more time for their families should inquire about telecommuting. Even if it’s just one or two days a week, the benefits can be considerable for both employee and employer. · Move closer to work. Commuting consumes a considerable amount of time. In its 2015 ThankYou Premier Commuter Index, Citi found that the average commute in the United States is 45 minutes, and that those commutes cost workers nearly $2,600 per year. By moving closer to their offices, workers can instantly create more time for their families and potentially save themselves considerable amounts of money.